When you think about the music scene in Seattle in the 90’s, you probably think of Nirvana, Pearl Jam, Alice in Chains – grunge was huge, and Seattle is where it all started. And as a teenager of the 90’s, I was one of the fortunate to have experienced it all; live in clubs that allowed 16-year-old patrons before 11pm. What you might not think of is world class performing arts. In the 90’s Seattle was one of only six cities in the United States to have a major symphony, an opera company, and a ballet – with all three sharing the same home. The Seattle Center Opera House was booked virtually every day of the year, with no room for flexibility in schedules or to add additional performances. In 1993, a local man named Jack Benaroya read an article in The Seattle Times arguing for a new home for the symphony, they needed a permanent place that was made for the unique sound of a large group. He agreed, and through his foundation gifted $15 Million to get the project started. 1998, After one of the most ambitious capital campaigns in the city’s history ($159 Million was donated through private funds) Benaroya Hall opened in the heart of downtown, occupying a full city block. 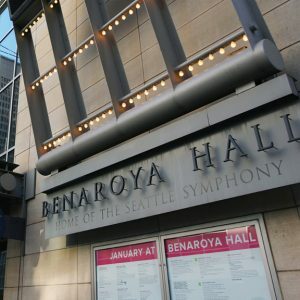 Benaroya Hall is known for its state-of-the-art acoustics, its elegance, and its prime location; all adding to Seattle’s tourism industry and helping support small businesses. Directly underneath Benaroya Hall is the Great Northern Tunnel, where freight and passenger trains run through every day. In fact, there is a station integrated into the Hall to allow for public transportation to events. Sounds noisy? Here’s an interesting fact: the concert hall is protected by the rumblings of the trains and the traffic outside by floating on giant rubber pads. The inside of Benaroya is full of elegance. The main lobby is an expansive room with large glass windows. Its centerpiece is a one-of-a-kind Dale Chihuly chandelier titled Crystal Cascade. The concert hall is not only the home of the world-renowned Seattle Symphony and the Seattle Symphony Chorale, but you can also see jazz musicians, pop acts, comedians, and musicals at the hall. For example, on February 15th you can attend A Bowie Celebration: The David Bowie Alumni Tour! You can easily take public transportation, or if you are driving, there is an underground parking garage, that can be accessed on Second Avenue just south of Union Street. Parking is $16 unless otherwise noted. If you are unable to attend a performance or just want to learn more about Benaroya Hall, they offer free docent-led bi-monthly tours. Tours last approximately one hour and are recommended for guests aged 10 and older. You can sign up for a tour on Benaroya Hall’s website. If you are planning a trip to our beautiful city, consider booking one of our luxury Seattle vacation homes. Did you know we offer rentals in the heart of downtown within walking distance of Benaroya Hall, as well as homes in some of Seattle’s best neighborhoods? For more information on our vacation homes or for help finding the perfect rental, please contact us today.